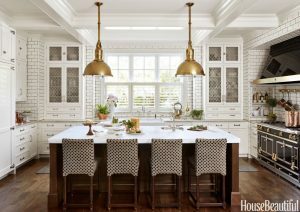 In a recent House Beautiful article, a newly-built gem in Michigan is featured due to its scullery-inspired kitchen. This East Grand Rapids home is for the true chef and has no-nonsense accents, like overscale Circa Lighting brass pendants and acres of simple white subway tiles (with charcoal grout to hide grease stains!). The result: a kitchen as good-looking as it is hard-working. Create a place for everything. 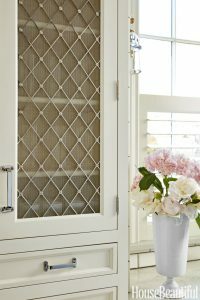 To improve workflow, position flatware drawers next to the dishwashers, spice drawers beside the range and cutting boards in a divided drawer within the island. Never to match everything because it can get boring. 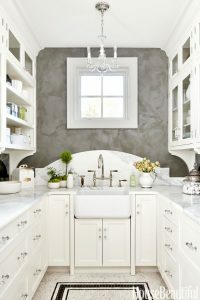 When it came to selecting the kitchen’s sinks, consider a traditional English farmhouse double-bowl style from Rohl and a French-influenced hammered-metal prep sink from Waterworks. Create a work area that’s scaled for meal prep, without the need to run laps. Bringing everything in closer is not only cozier, it also makes cooking, cleaning and grocery unpacking a lot less aerobic. The clients went gaga for Waterworks’ utilitarian Watt sconces, which are modeled on telephone-pole insulator covers, but Zaveloff was unsure of where to mount them. Rather than nixing the fixtures, the designer had tiled columns constructed next to each window and installed the sconces there. At night, the family switches them on as a low-light alternative to the brighter overheads. 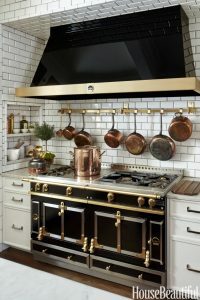 A built-in stove-side niche puts everyday seasonings within arm’s reach, while a pot rack mounted above the La Cornue range keeps well-used copper cookware where the action is.